Those booting up their Xbox for another fun gaming session will find an update available on Tuesday, December 6. 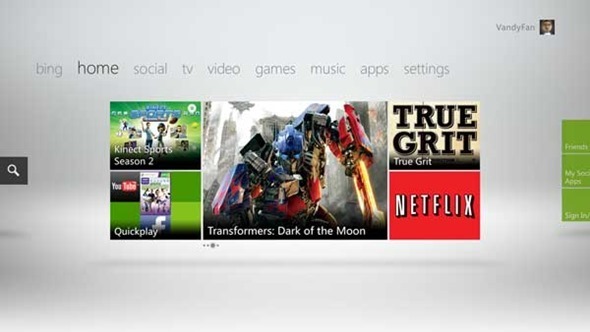 The long awaited revamp of the Xbox LIVE interface will include many new features. A few lucky players were selected to preview the update, but the official launch will now be available to all early next month. The update will include new "personal and social features." Your Game Saves and Live Profile will now be stored in the cloud. This will make it a whole lot easier to transfer your info when upgrading or swapping Xbox consoles. Before, a data transfer would be necessary. A beacon will allow you to share with friends, both on Xbox LIVE and Facebook, what you’d like to play. Friends can jump in and play with you or vice versa. How about all those achievements you win? You can now easily share them on Facebook. This is exactly what it sounds like. Parents have more control over what can be watched, played or purchased on Xbox LIVE. The update will make it easier to navigate through the new menus, videos, music and games. You can use a controller, gestures or simply use your voice to speak the command. You can now search the web with style. Don’t worry, you won’t need a keyboard. Simply search using your voice. Bing voice search will be available this year in the US, UK and CA. You can take your profile anywhere. The Wii allowed you to bring your Mii to friend’s console by brining your WiiMote. With the December update, you can bring your Xbox LIVE Profile, along with your Avatar, Game Saves and Gamer Score by just logging on, no need for gamer tag recovery. "Starting on December 6th and continuing on an ongoing basis through the holiday months, a wealth of new content will be coming to Xbox 360. New, customized applications for television, movies, internet videos, sports and music will begin rolling out from world-leading providers in more than 20 countries." As an Xbox player I can’t wait to see the new Dashboard in action. We’ve seen videos and screenshots online but now we can see it for ourselves in just a few weeks.